Try one for free! Simply ask your server. 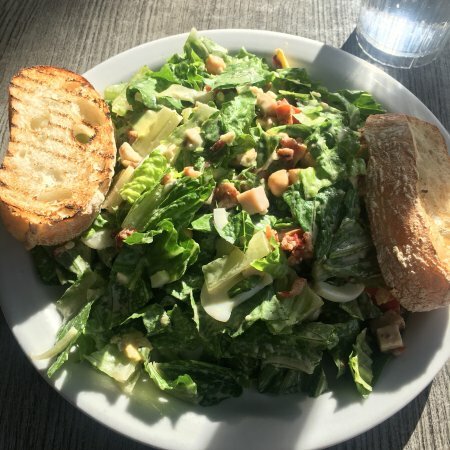 Served with your choice of toast, a bagel, or English muffin (breads not GF) AND your choice of sliced tomatoes, cottage cheese, or O'Brien potatoes (made with diced peppers and onions and grilled with a canola/olive oil blend). 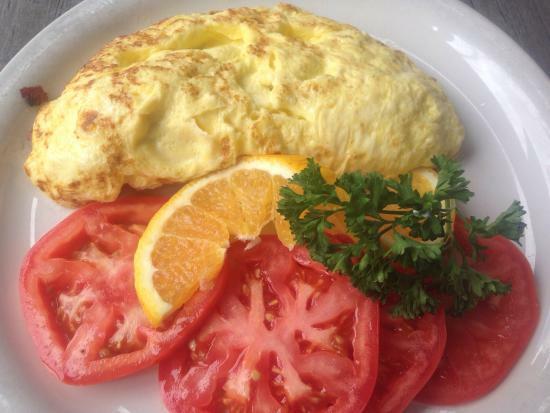 Our favorite omelet! Stuffed with our own cut center cut maplewood bacon, fresh spinach, and feta. Stuffed with diced smoked ham, cheddar, green peppers, and diced onions. Filled with cheddar and delicious sautéed green peppers, onions, mushrooms, and tomatoes, and then topped with avocado. Simple and delicious. Your choice of cheddar or Swiss. Stuffed with cheddar and fresh green peppers and onion and then topped with sour cream and homemade mango salsa. Fresh cut and sautéed mushrooms and cheddar. Diced smoked ham and cheddar. Stuffed with diced smoked ham, cheddar, and fresh mushrooms and tomatoes, and homemade mango salsa on the side. 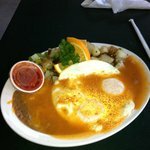 Two eggs over easy on corn tortillas topped with our homemade rancheros salsa. Served with O'Brien potatoes, refried beans with cheddar, and smoky sauce on the side. An English muffin topped with two poached eggs, freshly chopped spinach, and avocado, and then slathered in hollandaise sauce. Served with O'Brien potatoes. A healthy plate of grilled marinated chicken breast, scrambled eggs whites, avocado, grilled Roma tomatoes, and smoky hot sauce served on the side. Paleo friendly! Each item served separately on the plate. Two poached eggs and thin cut tavern ham topped on an English muffin and slathered with hollandaise sauce. Served with O'Brien potatoes. A buttery croissant baked in house stuffed with scrambled eggs, American cheese, and tavern ham. Big enough for two! Served with O'Brien potatoes. 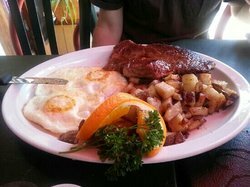 Two eggs and style and a juicy New York 8oz steak with creamy horseradish and our homemade smoky hot sauce on the side. Served with O'Brien potatoes and your choice of toast, a bagel, or an English muffin. An English muffin topped with two poached eggs and ripe avocado with sour cream and homemade mango salsa on the side. Served with O'Brien potatoes. For when you want it all. Two eggs any style, one giant buttermilk pancake, and your choice of bacon, sausage, or ham. Your choice of a plain or onion bagel with cream cheese and served with lox, juicy tomatoes, and sweet red onion, and capers on the side. Served with O'Brien potatoes. A delightful mix of scrambled eggs, O'Brien potatoes, cheddar cheese, and your choice of chicken, bacon, or sausage wrapped in a flour tortilla. Served with salsa verde, habanero salsa, and smoky hot sauce on the side. Choice of center cut maplewood bacon, smoked ham steak, or sausage patties. Scrambled eggs with diced green peppers, onions, tomatoes, and served with our homemade mango salsa on the side. Scrambled eggs combined with diced smoked ham and cheddar cheese. Fresh-baked buttery croissants dipped into egg batter and cooked to perfection, then dusted with powdered sugar. A rich and delectable treat. Loaded with blueberries. Just like Aunt Fluffy used to make at the mountain cabin. Grilled with 1¼" thick fresh egg bread and dusted with powdered sugar. Grilled with 1¼" thick fresh cinnamon-swirl egg bread and dusted with powdered sugar. Comes with coffee or tea, a fruit cup, and your choice of toast a bagel, or an English muffin. Sweet honeydew, cantaloupe, and grapes mixed together and topped with bananas and strawberries. Topped with fresh strawberries and bananas and served with your choice of milk, soy milk, or vanilla yogurt. One scrambled eggs, one sausage patty, and ½ slice of French toast. One scrambled egg, one strip of bacon, and one mini-pancake. Side of toast w/butter and jam. Side of bagel w/cream cheese. Side of English muffin w/butter and jam. Side of croissant w/butter and jam. We were all happy with our breakfast choices. I had a Bloody Mary with my eggs benny and both were really good. Generous portions. Stopped in in a whim .. nice menu good service food was fine!! What more could you ask for!!! 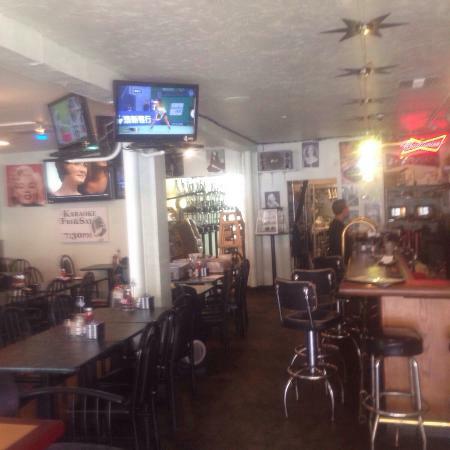 Very convenient location on Palm Canyon good people watching area too !!! Sandwiches leave a bit to be desired; even though we heard they were good. Not great service and average food just doesn't cut it. I am sorry you did not have a good experience. Pretty good eggs and bacon. Open early. The restaurant was nearly empty at 9 am. Dated decor. Very fast service. 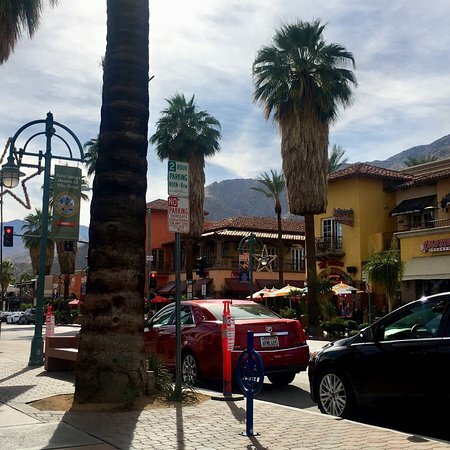 Prices were about average for Palm Springs. I am glad you liked your breakfast. Our customer base does get up pretty late hence the empty at 9 , this is why we serve breakfast until 3 pm to catch them when they finally get out of bed. Great place for breakfast. No pretty decor, but food quality, service, and value were there. Ate here twice for breakfast and enjoyed both times. 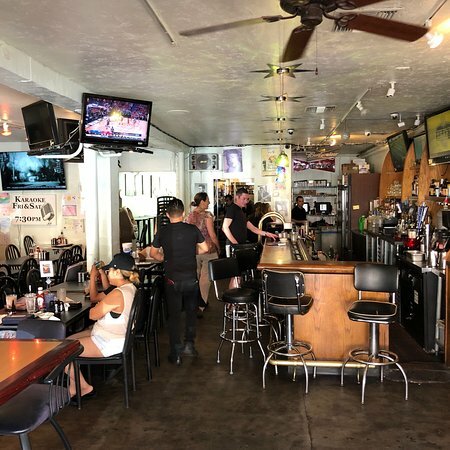 Great food and fun staff? It was great to have you in . Thanks for the great review! I've been here two or three times with friends because they had coupons. Each time was a disaster. Terrible food badly cooked, dirty room, indifferent staff. I am sorry our restaurant does not meet your expectations. 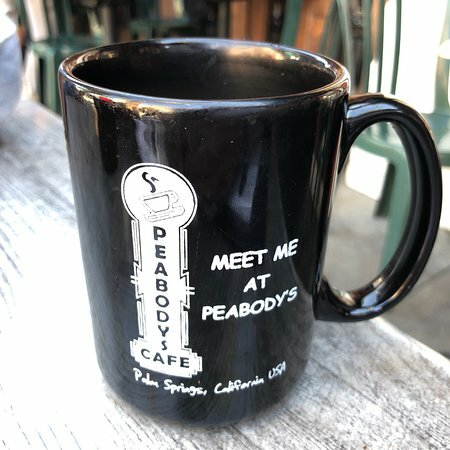 Get quick answers from Peabody's Coffee Bar staff and past visitors.